Washing your hair to look your best for a big meeting or putting on blusher to hide a heavy night is something countless women do every day. But many may be unaware of the dangerous ingredients lurking within their make-up, skin care and hygiene products. Growing research suggests women are unknowingly exposing themselves to thousands of chemicals that have been linked to everything from eczema and acne to even infertility and cancer. 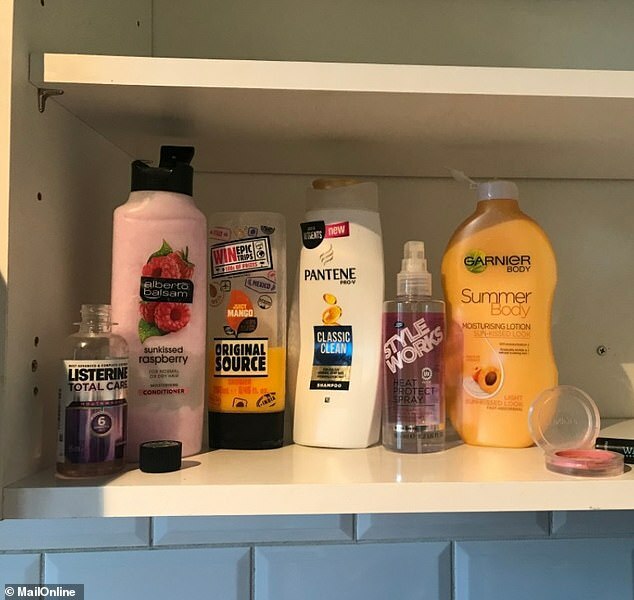 MailOnline looked at the chemicals found within products in a typical woman’s bathroom cabinet and asked experts how we can best avoid them. 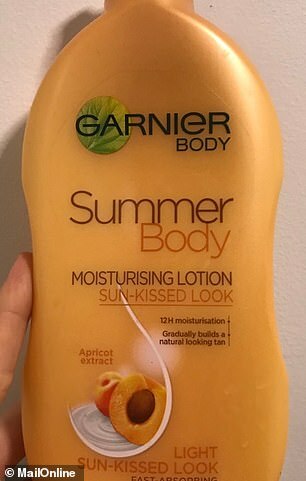 Garnier’s Summer Body sun-kissed moisturising lotion promises to give you a gradual, natural-looking tan, as well as 12 hours of moisturisation. But it also contains ethylparaben, which is added to many products as a preservative to extend their shelf life. Evidence suggests all parabens – which also include methyl and butylparaben – disrupt the body’s delicate endocrine system. This is made up of all our hormone-producing glands, including the pituitary gland, pancreas and ovaries. Known as the tuning fork of the body, the endocrine system controls the chemical messengers that essentially ensure everything is working as it should be. Disruption to the endocrine system has been linked to everything from infertility-related conditions such as endometriosis, fibroids and polycystic ovarian syndrome to early onset of menopause and puberty. This is may be due to parabens altering the release of oestrogen, according to Breast Cancer UK, which is the hormone that regulates menstruation and a woman’s reproductive system. ‘Hormones are active at incredibly low levels in the body,’ Dr Anna Pollack, assistant professor of epidemiology, at George Mason University told MailOnline. The Environmental Protection Agency in the US has even associated parabens with cancer, which is thought to be due to oestrogen stimulating breast cancer cells, causing their growth. Dr Emma Meredith, director of science at the UK cosmetic trade association CTPA said: ‘There has been no causal link found between the use of parabens and breast cancer’. She added: ‘Just because something has the potential to mimic a hormone in vitro (in a test tube) does not mean it will disrupt the endocrine system in vivo (in the body)’. L’Oreal, which represents Garnier, has been approached for comment. Pantene Pro-V Classic Clean Shampoo claims it will give you healthy-looking, shiny hair. But, like many products, it lists ‘parfum’ as an ingredient. Parfum, or fragrance, is known as an ‘umbrella ingredient’ as it can cover literally hundreds of undisclosed chemicals. 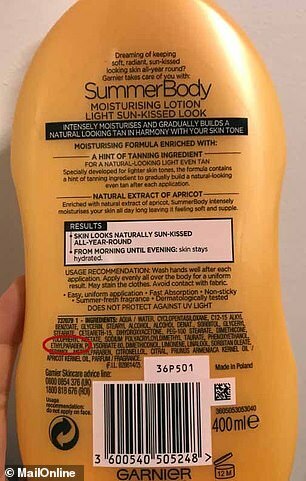 Rather than having to list each scent on a product’s label, cosmetic manufacturers can put them all under the term fragrance – leaving a user with no idea what they are actually putting on their skin. These scents are taken from a list of around 4,000 ingredients from the International Fragrance Association. A study released earlier this year by Breast Cancer Prevention Partners found there were 338 fragrance chemicals lurking in 25 personal care products, of which three quarters were linked to chronic health concerns. California’s National Toxicology Program, which is run by the state’s Department of Health and Human Services, even lists many of these 4,000 ingredients as being cancer causing. 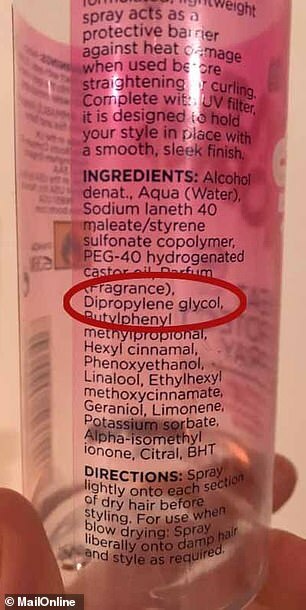 Proprietary rights mean it is unclear exactly what Pantene Classic Clean or other fragrance-containing products are made up of. However, perfumes tested in the lab often contain hormone-disrupting chemicals known as phthalaes. Phthalaes are added to fragrances to make the scent last longer on the skin and, like parabens, they mimic oestrogen and could cause the same health concerns. Dr Meredith added: ‘Some, but by no means all, members of the phthalate family have been found to be reprotoxic when tested at high doses in laboratory animals. 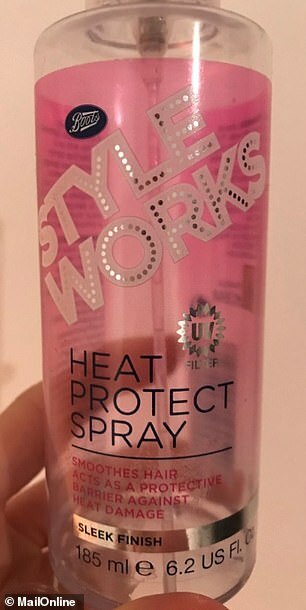 Boots Style Works Heat Protect Spray markets itself as a ‘protective barrier against heat damage’. But it contains dipropylene glycol – a fragrance carrier that is added to products to maintain their scent. Parfum is another ingredient. Although little is known about dipropylene glycol, it has been linked to skin and eye irritation, particularly in babies, the elderly and those with allergies, the Environmental Working Group (EWG) – a non-profit activist group – reports. More is known about propylene glycol, with the two being derived by the same chemical process and sharing a similar structure. Propylene glycol, which is also added to products to maintain their scent, can cause a burning sensation on the skin, as well as kidney and liver abnormalities. The Agency for Toxic Substances & Disease Registry states it ‘may harm you’. Boots has been approached for comment. 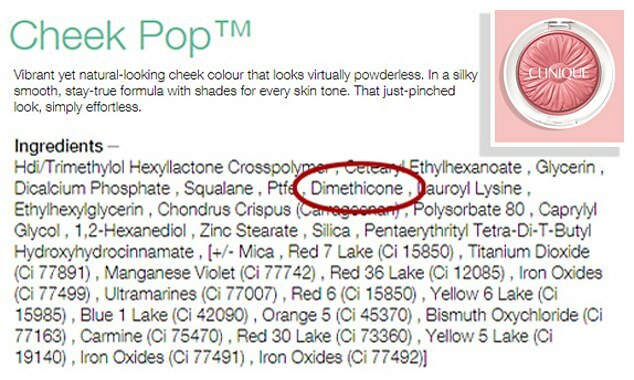 Clinique Cheek Pop promises a ‘vibrant yet natural-looking cheek colour’ – but also lists dimethicone among its ingredients. This is added to products to help them spread easily over the skin and leave a matte finish. Although listed as a low-risk chemical by the EWG, studies have linked dimethicone to skin irritation. This is thought to be due to it trapping bacteria and skin oils on the surface, which could lead to acne. Its coating action is also thought to prevent skin from performing its normal functions, like sweating. Dimethicone, which is also added to cleansers and moisturisers due to its velvety texture, has also been suggested as a potential eye irritant. Estée Lauder, the brand behind Clinique, has been approached for comment. 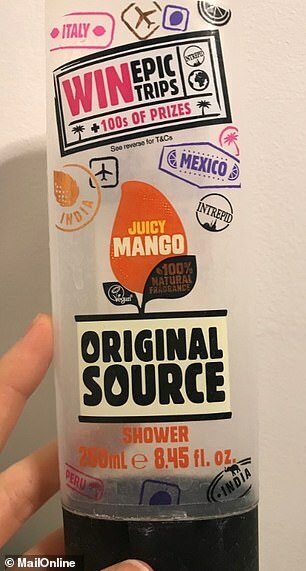 Sodium Laureth Sulfate (SLS) is found in many shower gels, including Original Source Juicy Mango, as a cleanser. Although it originates from coconuts, the manufacturing process causes SLS to be contaminated with the byproduct 1,4 dioxane. Dioxane is ‘possibly carcinogenic to humans’ and may cause toxicity of the liver, kidneys and central nervous system, according to the US federal agency National Institute for Occupational Safety and Health. The EWG rates SLS as a ‘moderate hazard’, with research by the University of Bath also linking it to skin irritation. SLS is thought to disrupt the natural oils that maintain the skin’s barrier function. This could reduce skin’s ability to keep dangerous substances out, which may trigger eczema. Original Source has been approached for comment. Listerine’s website claims zinc chloride is added to its mouthwashes due to it being ‘clinically proven to control tartar buildup’. Although mouthwash is not meant to be swallowed, the Centers for Disease Control and Prevention warns accidental inhalation can cause shortness of breath, a sore throat and a burning sensation, while spilling it on the skin can lead to burns. Mistakenly swallowing the chemical can also cause severe vomiting, and even shock and collapse, which occurs when an insufficient amount of blood circulates around the body. While chemicals in oral care may seem harmless, research suggests the mucus membranes under the tongue are the thinnest of anywhere in the body and therefore may allow such compounds to be readily absorbed. A spokesperson from Johnson & Johnson, which makes Listerine, said: ‘Zinc chloride has a long history of safe use as an effective mouthwash ingredient. 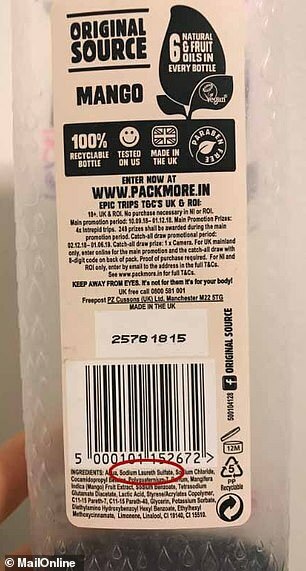 ‘It is recognised as safe by health authorities around the world, and under EU Cosmetic Regulation has no regulatory restriction at the concentration used in Listerine Total Care. 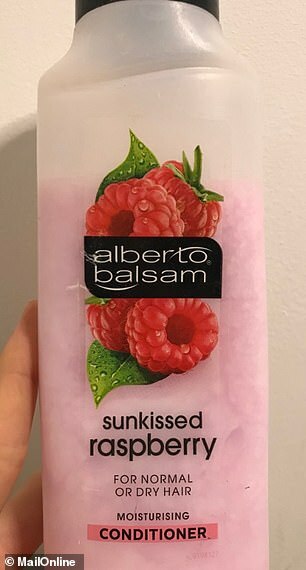 PEGs are commonly added to conditioners – like PEG 150 Distearate in Alberto Balsam Sunkissed Raspberry Conditioner – as a thickener and softener. Depending on the manufacturing processes, PEGs can be contaminated with ethylene oxide and 1,4-dioxane. The International Agency for Research on Cancer classifies these as known and possible cancer-causing substances, respectively. PEGs have even been linked to breast, stomach, bladder, pancreas and brain forms of the disease. The California Environmental Protection Agency, which operates within the state’s government, also classifies ethylene oxide as a developmental toxin that may interfere with human growth. Unilever, which represents Alberto Balsam, has been approached for comment. How can we avoid chemicals? 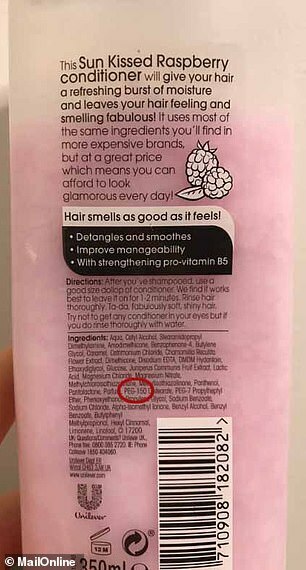 Although avoiding chemicals may seem impossible, doctoral student Anna Young, from Harvard, told MailOnline that reading a product’s label is a good place to start. ‘Consumers who want to reduce their chemical exposure should look at the ingredient labels,’ she said. And if a woman chooses to start eliminating chemical-ridden products from her day-to-day routine, she could start by ditching those that stay on the skin. ‘A good place to start is the products you don’t rinse off, the products you leave on your skin,’ Dr Pollack said. These include moisturisers, serums, oils and fake tan. Women can also reduce their exposure by opting for certified organic products, which have been confirmed to contain a certain amount of organic – and therefore non-chemical – ingredients by an external regulating body. ‘Certified organic or natural products are an avenue that is growing in popularity but it’s not always regulated, things can say “all natural” but not be,’ Dr Pollack said. Women should therefore look out for logos like the Soil Association and EcoCert on a product’s packaging. Dr Pollack added: ‘[Organic products] are typically more expensive so aren’t an option for everyone so the first option could be looking for fragrance free or a shorter list of ingredients.